The limitless opportunities and options that the motion capture technology can provide will be well on display in Superstar Rajinikanth’s Kochadaiyaan. The film’s director Soundarya Rajinikanth Ashwin recently revealed that technology has enabled them to revive the late great thespian Nagesh in her animated magnum opus. 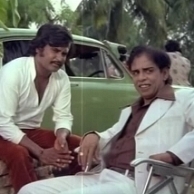 It is learnt that an actor was made to re-enact the classic mannerisms of Nagesh, who had passed away in 2009, and the movements have been translated in a life-like manner on screen for the character. When the inevitable comparisons to similar projects such as Tintin and Avatar cropped up, Soundarya offered a valid response by saying that the characters of Tintin and Avatar were imaginary but Kochadaiyaan had the massive task of recreating real life personalities, and even with those challenges the film’s production period has been swift, she said. She went on to assert that the characters will appear like their real selves in the film. Kochadaiyaan’s audio, composed by AR Rahman, is set to be launched in a grand manner on March 9th with the biggest stars in the country assembling for the occasion. The 12 Commandments Of Kochadaiyaan, Penned By Vairamuthu! People looking for online information on Kochadaiyaan, Nagesh, Rajinikanth will find this news story useful.